SES members and returned service men Eddie Aiken (left) and Michael Osenbaugh (Right) at the Hamilton Hill RSL for ANZAC day commemorations. 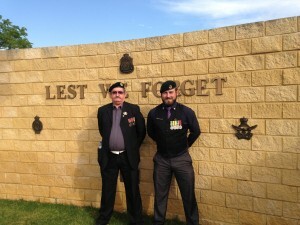 In the news: ‘Got your back’ is a Fremantle Herald article about supporting our returned service personnel. Returned service man Michael Osenbaugh helps provide insight on what it is like to returnfrom conflict and the integration back in to normal life. Michael is also a member of our SES unit. A brave article.